I want to share with you a recent recipe I made the other night. It is with quinoa again, but what can I say… I just love quinoa! It is my preferred grain, as it is high in protein (one cup of cooked quinoa contains 8.14 grams of protein). 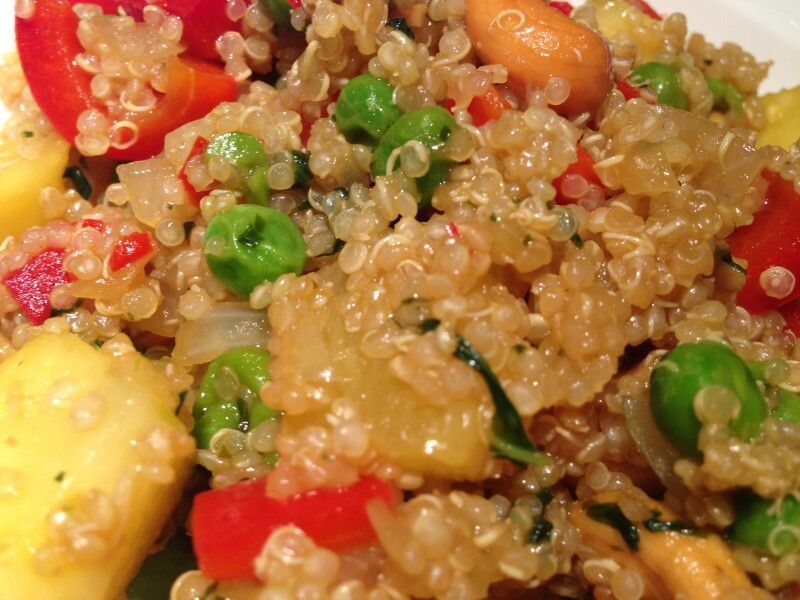 Quinoa is also a great source of iron and fiber for vegetarians. This is my version of a recipe I have found in the cookbook Veganomicon. If you are vegan, or just want to incorporate more plant-based foods in your diet, make sure you get this book. There are some great recipes in there. Prepare the quinoa first: combine the well rinsed quinoa, juice, water, and tamari in a medium-size pot. Cover, place over high heat, and bring to a boil. Stir a few times, lower the heat to medium-low, cover, and cook for for 12 to 14 minutes, until all the liquid has been absorbed and the quinoa appears plumped, and slightly translucent. Uncover, fluff, and let cool. Prepare the stir-fry: Use a large nonstick skillet or a wok. Have all your ingredients chopped and easily within reach. Place the cashews in the dry pan and heat over low heat, stirring them, until lightly toasted, 4 to 5 minutes. Remove the cashews from the pan, raise the heat to medium, and add the coconut oil, onion, and garlic. When the garlic starts to sizzle, add the sliced chile pepper and ginger. Stir-fry for about 2 minutes, then add the red bell pepper and peas. Stir-fry for another 3 to 4 minutes, until the bell pepper is softened and the peas are bright green. Add the basil and mint, and stir for another minute before adding the pineapple and quinoa. In a measuring cup, combine the tamari sauce, vegetable stock, and mirin. Pour over the quinoa mixture. Stir to incorporate completely and coat the quinoa. Continue to stir-fry for another couple of minutes. At the end add the cashews and mix one more time. That looks delicious and so interesting! Never made stirfry with pineapple!